Mid-March to late spring is known as the swarming season in the United States. During this season, bees reproduce and split off from their original colony to form a new colony and find a new home. Don’t want to become neighbors with a new hive of bees? Here’s some tips and tricks on how to keep bees away from your house. Why Are Bees Coming to Visit? During the ‘swarming’ season, bee populations start to reproduce. Because of this growth in the colony, they branch out to make new colonies. These bee swarms migrate together—their new queen resting nearby while a scout bees check the surrounding area for an ideal place to nest. Bees looking for a new residence are attracted to areas that smell like honey. If there have been beehives in your area before or if they haven’t been properly removed, those dorment hives can act as a beacon for bees. Similarly, if your home is in their preferred climate or has a good source of food nearby, their resourcefulness will target your area.. Even big bees can get into a hole a quarter of an inch big. This means even the small gaps between siding may not be safe. However learning to seal those places with caulking or patching holes in your window screens should help deter bees and wasps from your home. If you find bees flying up into your skylights or in a room with a fireplace, they could be getting in through the chimney. Getting rid of bees in a chimney is dangerous so we recommend getting a proper bee removal from an expert. In order to determine in the bees are in your chimney, turn off all radios or appliances that make sound and sit next to the chimney to listen. With the absence of sound, you should be able to hear a buzzing. If you have a duct that leads to your stove’s vent or a laundry vent to help with your dryers ventilation, there’s a possibility that these places have become attractive to a new bee colony. If a bee is spending time in a room that has a vent, you may went to listen to the wall along where the vent travels. Be sure to close these vents to prevent bees from coming into your home and call a bee removal service. Over time, if not properly looked after, a gutter can cause holes in the sides of your home. Similarly, over time, attics can crack windows or small holes can form where there is no installation. If these places are infested they are dangerous to look through so be sure to call an expert to keep yourself from getting stung. Okay, now we know how and why they are getting into our homes, you may be asking, “How do I keep bees away from my house?” Besides the suggestion to check your home, attic, and siding for holes you can patch, here are some other preventative steps you can take to keep bees away from your home. You don’t have to get rid of those lovely flowers entirely, but putting them close to areas they may consider good for nesting only makes it more enticing for a swarm. Bees are attracted to flowers like poppies, honeysuckles, clovers, and herbs like oregano and thyme. They love brightly colors plants. So if they are potted, be sure to move them out of the way when you are enjoying the outdoors. Although it’s not in your home, some of your favorite outdoor activities may be creating perfect spots for bees to invade. A shed or big outdoor grill may be a great size for a hive, so be sure to cover your grills and properly seal your tree houses and sheds. Keeping a minimal amount of outdoor items will help in learning how to get bees away. Wasps aren’t bees; however, they can be confused for them quite frequently. Wasps enjoy human foods. So if you find some yellow and black buzzing around your trashcan or your outdoor gathering, it’s more than likely wasps. To avoid wasps, seal foods and throw trash away into a sealed container as soon as you can. Is Killing the Bees the Best Form of Pest Control? Avoiding bee stings may seem as simple as getting the proper insect repellent to kill a bee on the spot. However, due to Colony Collapse Disorder, a phenomenon that is really starting to hurt the agricultural industry, you may think twice about killing all bees. Make a difference in preventing harm to beehives and give Bee Master of Las Vegas a call. 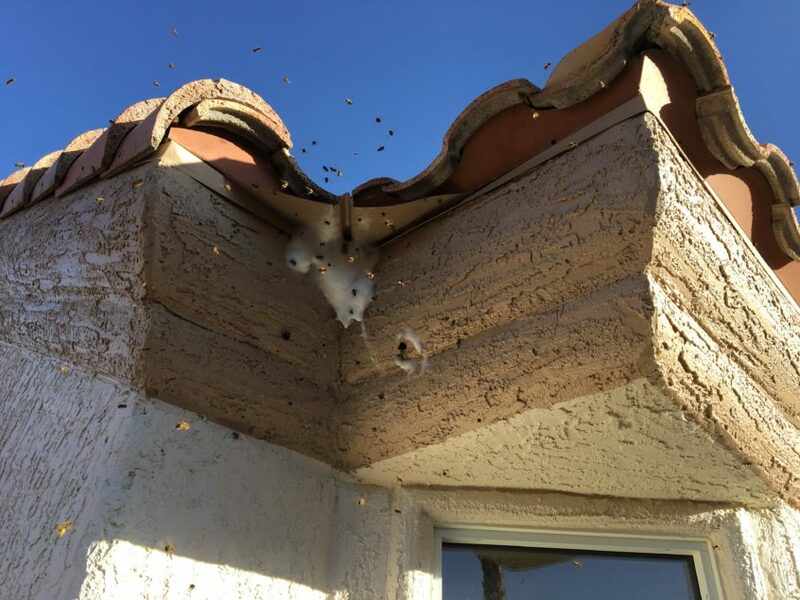 Our staff has years of experience in Las Vegas bee hive removal—safely, repair and prevention are our number one concerns!